**Tickets received for consideration. All thoughts are 100% my own. I love reading the letters of Paul. So often I find when I open up my Bible, I am drawn back to these letters, over and over again. 1 Corinthians, Romans, Ephesians... these and all the 14 letters attributed to Paul offer some of the greatest wisdom and insight on what it means to be a Christian. They teach us about love. They teach us about forgiveness. They teach us about grace. They teach us about perseverance. When we read these iconic words, it can be very easy to forget who Paul was. We see these messages of profound faith and see a man who seemed to have this Christian living thing down. After all, these are the verses WE strive to live by. And so often we feel as though we fall short. We forget that before all of these letters, Paul too was a sinner. Not only that, but he faught against and KILLED Christians. Wow. What a transformation! When I think about this and read these words again, and find even more power in them. How amazing a love that can transform 'the worst of the worst', what grace. If God can forgive THOSE sins, surely he can forgive ours too, right? I think this is where knowing the back story and truly digging deeper into the Bible is so important. We have to understand where these people came from to truly appreciate where they were at the time of writing. 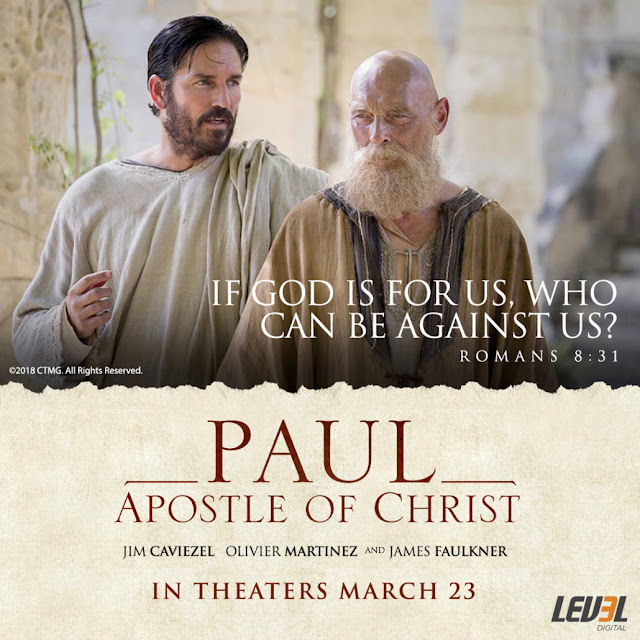 Today, I am very excited to share with you a new movie that might provide us a little insight into the life and writing of Paul. Now, first and foremost, let me just start by saying that no movie should ever replace reading and studying your actual Bible... but let's be honest, each of us has our own way of learning. Some do great with just reading and studying the history. That works for them. Others are visual learners. They find it hard to imagine this life that is so different than our own. We need something to bring it to life to give us that better understanding. That is just what this type of movie provides. We can experience and learn about the final year's of Paul's life in a whole new way to give us that deeper understanding in what we are reading. And that's pretty important, isn't it? Just in time to celebrate Easter, Paul Apostle of Christ will be coming to theaters Friday, 3/23/18, nationwide. You can find ticket info here. I love your blog, so I'm glad you're offering this giveaway because it gives me a chance to follow you in all the other ways that I hadn't gotten around to setting up yet! I like Jim Caviezel so I'm looking forward to this movie.